Another Fiesta de San Isidro has come and gone and was mostly a success. This is, by far, my favorite Madrid festival. 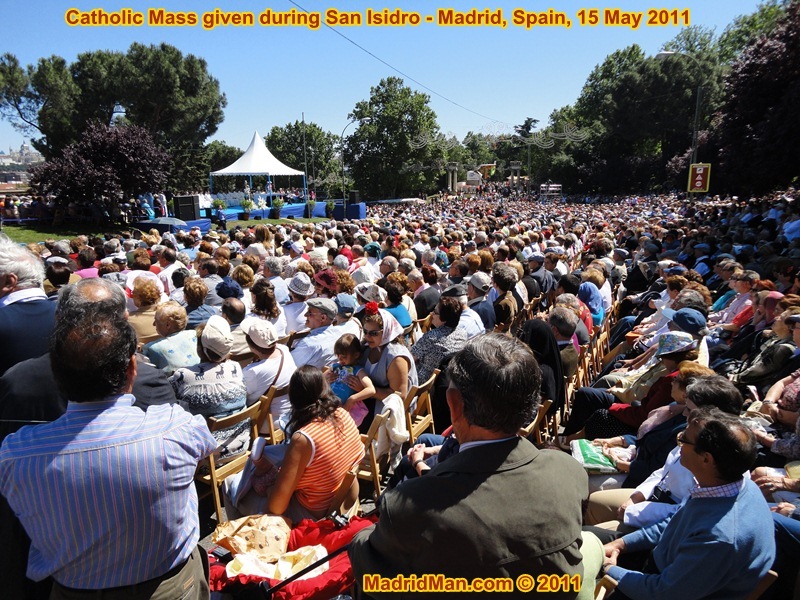 It is, afterall, a celebration of Madrid’s Patron Saint, San Isidro Labrador, and lasted from 11 May to 15 May 2011. The Fería de San Isidro, Madrid’s monthlong bullfight festival, started on the 10th of May. This year the 15th fell on a Sunday and the weather was perfect. We were lucky. 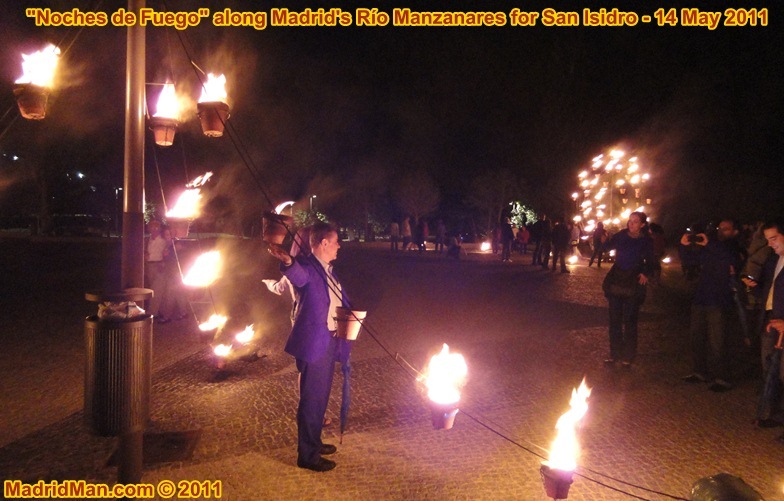 Basically, concerts in “Las Vistillas” and the “Jardines de Sabatini” were scheduled as well as a wonderful “Noches de Fuego” fire display along Madrid’s Río Manzanares, eating “rosquillas“, all capped off with traditional costumed “Chulapas” & “Chulapos” dancing “El Chotis” in the Pradera de San Isidro. VERY “Castizo“!!! FOOD: I started “celebrating” on Friday the 13th, going to downtown Madrid, passing through the Plaza Mayor and settling on “Taberna El Madroño” for lunch. 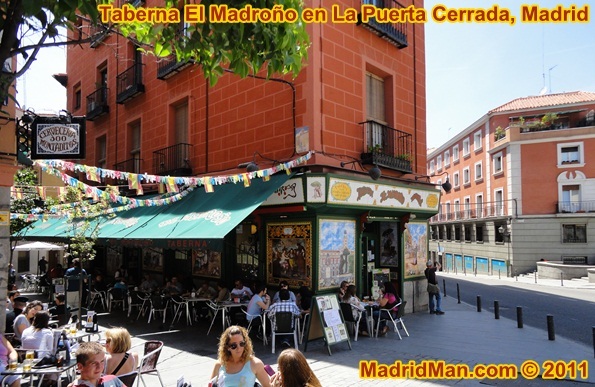 “El Madroño” is quickly becoming my favorite downtown lunch establishment, located in the Plaza de Puerta Cerrada on the Calle de Segovia, just south of the Plaza Mayor. Here, you can enjoy a wonderful lunchtime “Menú del Día” for just 9€ – either inside OR on the terraza, same price, and the food is good and abundant. The wait-staff is nearly totally Spanish and the wide, off-street (and awning-covered) terraza is very comfortable too. I chose and ordered the spaghetti and shrimp (oh, it was SOOOO goooood!!!) for a 1st course and the 2 fried eggs over fried potatoes with “pisto” for the second course. To drink, I chose the (carafe of) red wine with fizzy water (“Casera“). While dessert is included in the 9€ price, I was permitted to substitute a coffee instead – as I had a lot of walking yet to do. At the end, the house invited me to a free edible chocolate-coated shot-glass of licor de hierbas. Yum. It was all good and all filling. Sure, there were a number of tourists having lunch there but also a number of Spaniards too. A good sign. 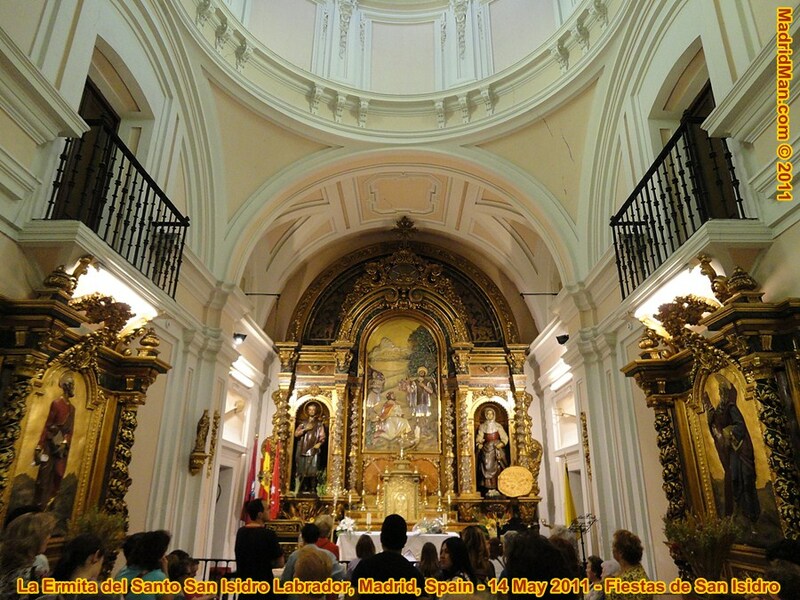 Full, happy, and not-so-ready to hit-the-bricks, I paid the bill and headed to the Colegiata de San Isidro – or, a.k.a., San Isidro Church, the church of the two bell towers you see through one of the south-facing arches of the Plaza Mayor. It was closed, not surprisingly, as they were preparing for their procession on Sunday, but the school part was open and full of uniform-wearing kids. I didn’t go in, but did take a moment to admire the church, built in 1664, for which San Isidro Labrador was named. 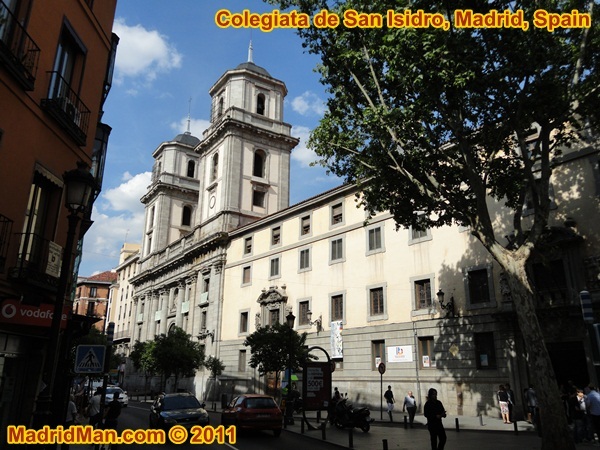 Until Madrid’s Cathedral, “La Almudena” (next to the Royal Palace), was completed in 1993, the Colegiata de San Isidro served as the city’s cathedral. From here, passed through La Latina and over to Las Vistillas, the picturesque area next to the long “Viaducto” bridge and with wonderful views of the “river valley” below as well as the Casa de Campo. Here is the venue of a number of concerts and traditional dances for San Isidro. Since I was early, they were only still setting up the stage and nothing was going on. Next, I walked past the enormous church, San Francisco El Grande and to the Puerta de Toledo, down Paseo de Pontones, and crossing the river bride “Puente de San Isidro” (next to the Estadio de Vicente Calderón – home of Atlético de Madrid football team) to the hill leading up to the Pradera de San Isidro. It was sunny and warm, mostly clear skies and surprisingly few people in the Pradera at this hour although all the “chiringuitos” (bars/restaurants) and game stalls had been constructed and open for busines. Arriving first at the Ermita de San Isidro Labrador, the tiny church named for an dedicated to Madrid’s Patron Saint, had no line to enter so I took advantage of the opportunity. What a cute, little church. On Sunday May 15th, the day of San Isidro, the line to enter would be 200+ meters long and slow-moving so I took advantage of the opportunity and walked right in with a handful of Spaniards. It was quiet, rather solemn, and I took a number of photos along with many others. On the northern side of the Ermita de San Isidro is the rose garden. To enter here there was a line of about 25 people, all waiting to take/taste the “healing waters” from the spring located there. At the time I arrived, people were permitted to go behind the counter, directly to the spigot & basin and collect their own water. But by the time I left, they closed access and two helpers served those wanting to fill their cups and jugs. After wetting my hand and tasting the water, I stepped back to watch the scene. These were ALL Spaniards waiting in line, no doubt locals to the area and knowing when to find the shortest lines. Many small children were dressed as “Chulapas” and “Chulapos”. The surrounding roses smelled wonderful. I then took advantage of the short lines and bought a dozen “rosquillas” for the weekend, to be eaten for breakfast and for “merienda“. There are MANY different kinds of “rosquillas” including “las tontas, las listas, las de Santa Clara, las de limon,” and on and on. From here I went home, going uphill, passing the “chiringuitos” and game stands where there were still few people. Sunday, the day of San Isidro, would certainly be a different scene – and it was. 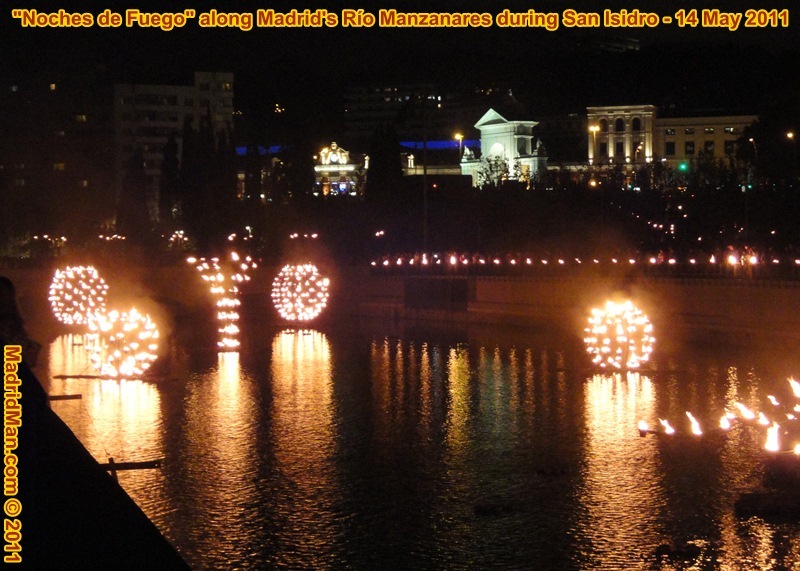 Saturday, the 14th of May, it rained most of the day and so I didn’t go to the Pradera, but I’d hoped to go down to the Río Manzanares that night to enjoy the “Noches de Fuego” (“Fire Nights”)- which I DID!! What a scene! Spectacular. 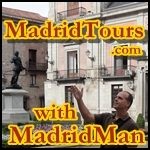 I went down to Madrid’s main river (and ONLY river! 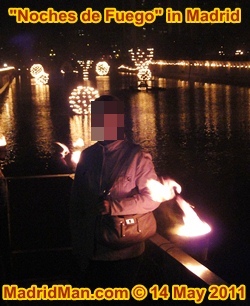 ), the “Río Manzanares“, at the Puente de Segovia (Segovia Bridge) and saw lights in the river to the north so we walked along the eastern bank with hundreds of others, heading towards the fire lights. Besides being a cool night (from ) 9:30pm to midnight, it was also very very windy. A few wind gusts whipped the flames to worrisome heights. So many were having their photos taken next to the pots of fire and, more than once, the flame came dangerously close to the person standing next to it. My fear was more that someone with long hair, a long, flowing dress, or curious children would be burned by the flames within reach. But I never heard or saw anything like that. There were some close-calls, however. It was a beautiful night, made even better by the full moon and the number of people enjoying such an unusual event. What’s next? “PULPO” (octopus) & Ribera white wine for dinner at 11:30pm at the Mesón A Ría de Noia – my favorite pulpo-place, not far from the Puente de Segovia. Perfect. JUST perfect. The day, the weather couldn’t have been better. I woke up early and headed to the nearby Pradera de San Isidro at about 10:30am. It was cool with clear skies. HOW MANY YEARS had this day been unusually hot?! Not this year. I started at the bottom of the Pradera de San Isidro and started uphill – slowly. This is a steep hill. 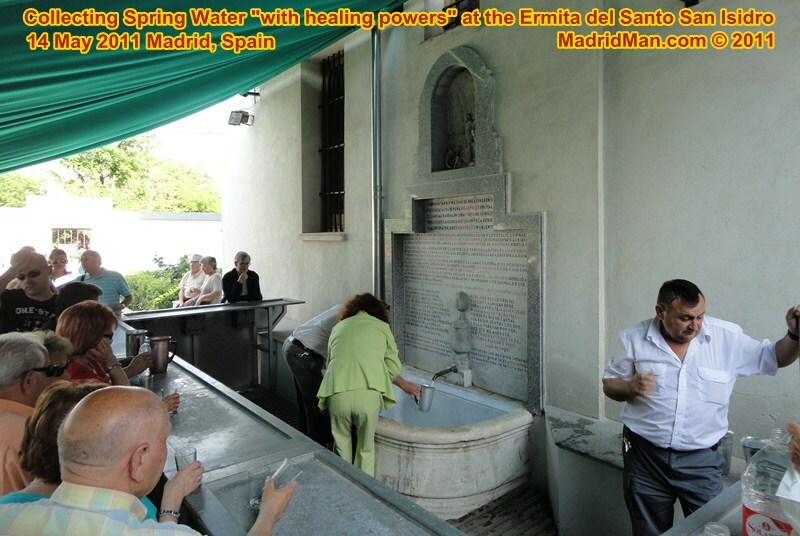 On my right I passed numerous people waiting in line to drink the waters and another line to enter the Ermita del Santo and I was SO happy I’d done this on Friday with essentially no waiting. Sure, I guess the thing is to do this ON the Día de San Isidro, but fine. 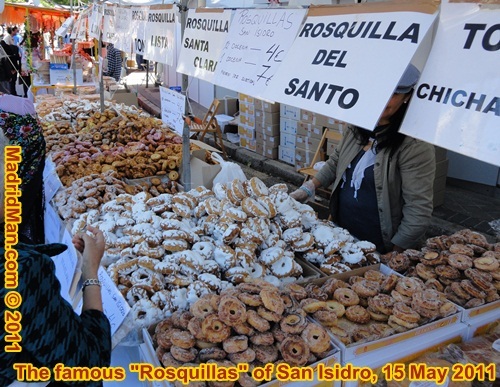 I reach the Ermita del Santo on my right and the stands selling “Rosquillas” on my left. HERE is where the crowds begin and HERE is where groups of dance troupes perform on the street, all dressed as “Chulapas” and “Chulapos“, dancing “El Chotis” and “Pasodobles” to recorded music. Most of these troupes represent certain “peñas” or clubs which perform freely on the streets at events like this. They are such much fun to watch, so perfectly dressed, and appear to enjoy themselves dancing as well as posing for photos. The little girls and boys dressed up in their traditional costumes is the best part of all. They’re just adorable!!! To be clear, the dressing-up as “chulapas” and “chulapos” seems to be something mainly done by older folks or for the very little ones (by their parents) – but you see few young people in their 20s or 30s dressed like this unless their parents are part of one of these clubs. The number of people attending Mass at noon had to reach a thousand. Wow. A LOT of people, all seated in the sun – but luckily not too warm. Next to the seating area was a LONG line of people waiting to receive their free “gorra de chulapo” (chulapo hat) or abanico (fan) for women to keep them cool, compliments of one or another society. It was about 1pm when I left for home, passing the dozens of “chiringuitos” lining the uphill street towards the concert stage, all emitting a mix of smells which was – different. Several enormous paellas were being prepared for the lunchtime crowd and legs of lamb were being boiled. 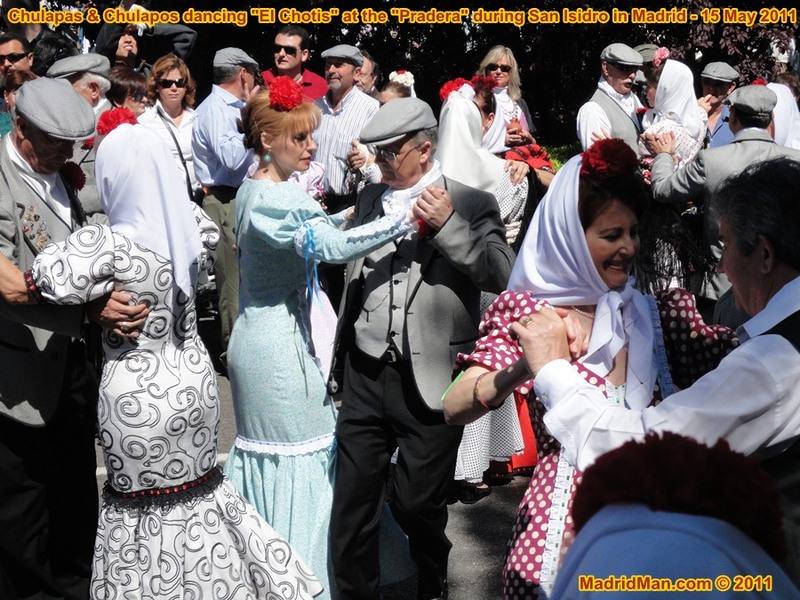 Someone told me, a Spaniard, that the San Isidro event was only for tourists and foreigners. I found this to be totally false. The vast majority of those I saw/heard in the Pradera de San Isidro as well as along the river were, BY FAR, Spaniards. 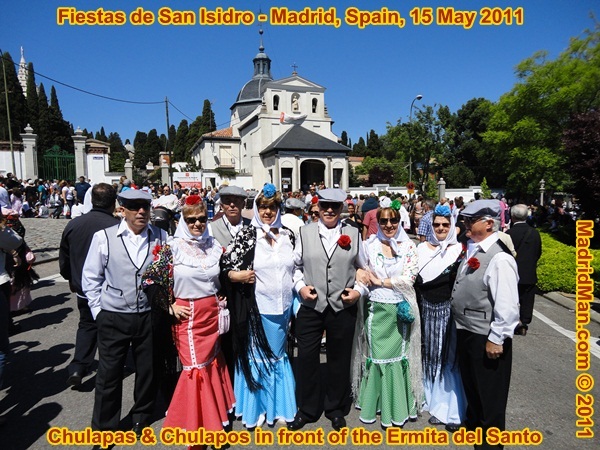 This entry was posted in About Spain, Entertainment, Food and tagged 15 May, 15 mayo, 2011, bullfight, castizo, chotis, Chulapas, Chulapos, costume, dress, El Madroño, ermita, Ermita del Santo, festival, Fiesta, las vistillas, Madrid, Noches de Fuego, pasodoble, pradera de san isidro, rosquillas, san isidro, Taberna, traditional, Video. Bookmark the permalink. Wonderful blog story! I feel almost like I was there. indeed I think it is your best story yet, maybe because I like and follow San Isidro all my life.Thanks for the stories it was very moving to see the pictures, videos and nice narrative. I think San Isidro Festival in Madrid is very atracting festival.. 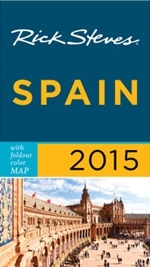 I hope i can visit Madrid and all of Europe.. Nice share..